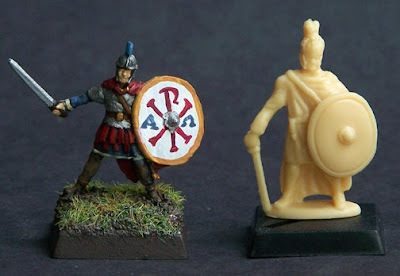 As I mentioned in a previous post, Hat's 1/72 Late Roman Heavy Infantry set is a bit smaller than their Medium Infantry. Their shield sizes also differ. I am including a heavy inf. 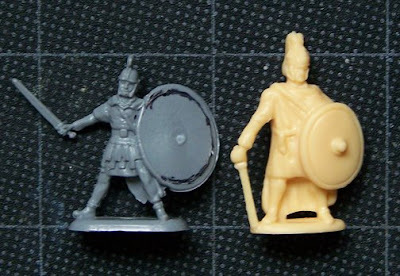 swordsman in my Song of Arthur and Merlin Romano-British warband (in-progress). The rest of the figs are Hat's medium infantry models. To compensate for the size difference I trimmed the edge of the large shield, moved the boss to the left, stacked a piece of styrene under the little guy, and added a little green stuff to his wimpy hand. I'll post a picture of the full warband when it is complete (in a few days). It's a real shame that Hat didn't keep to the same scale for the same army. A 1/72 late Roman army is on my lengthy todo list after Hat cavalry come out but I'm disappointed by the look of the medium infantry. 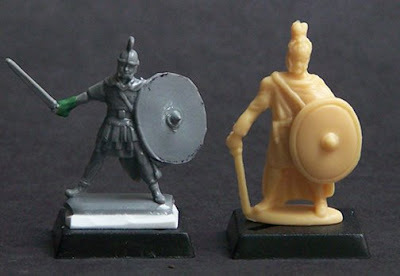 I've already got a large 15mm late Roman army, so this project looks like it will be moving down the list! Whats with the guy on the left doing the splits? This is a very strange pose... other than that, not a bad model, with plenty of detail. I'm not familiar with this maker but I agree it's a shame they have changed scale mid-range. You're not familiar with Hat? *Gasp! * They loom so large in my hobby. I'd say Hat is one of the driving forces of the current 1/72 plastic toy soldier Golden Age. Some of Hat's stuff is very detailed, others not not good. Overall, they have done a good job of creating sets that fill in gaps in the market.